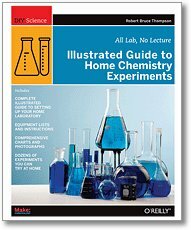 Gràcies a Boing-Boing he vist que sortit a la llum l’e-book de la publicació Illustrated Guide to Home Chemistry Experiments. Es pot comprar, com a pdf, a O’Reilly per 24 USD, però aquest dies, fent servir el cupó de descompte de Boing-Boing, només en costa 10. En paper costa uns 30 USD, encara que el combinat amb e-book no és pas gaire més car. A Amazon.com el llibre, de 2008, el venen per uns 20 USD. I concluded that the only good solution was to write a new book, one devoted to learning real chemistry at home, and one that would also be useful for the many thousands of other people out there—young people and adults—who wanted to experience the magic of chemistry just as I’d done on that long-ago Christmas morning, and to do so on a reasonably small budget with readily-available equipment and chemicals. And so Illustrated Guide to Home Chemistry Experiments was born. This book is dangerous. It will cause kids to start thinking. There is a definate risk that they will starting wanting to learn about the world around them instead of just studing the answers to a test. I am old enough I remember chemistry sets under the christmas tree and a high school chemistry class were students actually did experiements instead of just watching. DO you, or your childern, want to actually learn chemistry? Then get this book. Laboratory work is the essence of chemistry, and measurement is the essence of laboratory work. A hands-on introduction to real chemistry requires real equipment and real chemicals, and real, quantitative experiments. No existing chemistry set provides anything more than a bare start on those essentials, so the obvious answer is to build your own chemistry set and use it to do real chemistry.